We hate to say it, but it’s already August! Our adventurous teachers are probably starting to think about the new year, and probably starting to already think about ways to get your classroom outside while the weather is still nice. 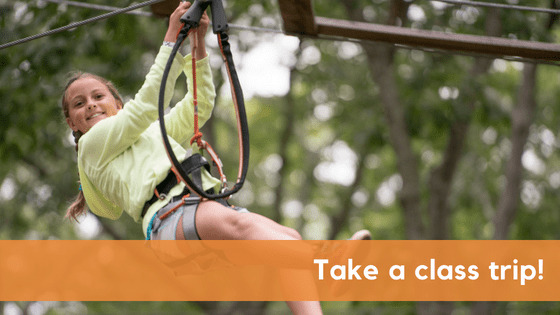 Here’s some ways that you can get your class on a trip to Tree to Tree! Observe Animals and Food Webs! Learn about the parts of a tree: What better way to learn about roots, stems, and leaves than by climbing a tree! Learn about force, motion, momentum, energy, and more! There are 6 basic simple machines; the lever, the wheel and axle, the inclined plane, the wedge, the pulley, and the screw. You can find many of these throughout the courses! Have you heard of Zipline Barbie? Learn about the Pythagorean Theorem, Angles of Elevation, of the length of a right triangle. This awesome teacher is sharing lesson plans & classroom materials for Zipline Barbie! Ready to get your class trip booked? Give us a call at 208-423-8289 for group rates and availability!